Joseph Fidler Walsh wasn’t always a highflying Eagle y’know. Back in the day his brilliant guitar playing and often witty showmanship graced the unfairly overlooked James Gang, a five piece band that soon became a superb power trio with drummer Jim Fox and bassist Dale Peters watching on in awe as Joe hotwired his lead to create an overdrive attack sound that became his trademark. The James Gang rocked it out of Cleveland, Ohio for several years and worked closely with producer Bill Szymczyk, helping him to become a go to console master for a variety of hard rock groups that include The J. Geils Band and, latterly, The Eagles. Walsh and co became a huge draw in their adopted Mid West and opened for The Who, Led Zeppelin, Three Dog Night and Humble Pie and were never disgraced – often doing enough to make the stars of the evening look over their shoulders. With Joe on board the Gang released their renegade rock masterpieces Yer Album, …Rides Again, Thirds and the Live In Concert (Carnegie Hall) disc. All these albums are highly recommended and are instrumental in shaping the career of Walsh as he goes solo and gradually becomes a superstar. With his band Barnstorm (though this is always Joe’s thing) he began to slowly build momentum, first with a self-titled band album, then with the mystical breakthrough convolutions of The Smoker You Play, The Drinker You Get – including the smash hit single Rocky Mountain Way’ whose slow phased boogie inspired many an aspiring bedroom guitar hero wannabe to dust his or her broom. We’ve got Mr Walsh well covered here and dig his crazy approach to the rock business – at once sardonic and then true to the flame. He’s sold a gazillion records along the way – life’s been good – but also dealt with personal stuff and emerged intact. An adopted son of American and Scottish/German ancestry, young Joe was born in Kansas in 1947 but raised in Ohio. He spent his teenage years in New York and New Jersey and attended Kent State University. Rapidly acquiring a rep as the gun slinging axe man of his locale Walsh played with a bunch of post high school bands, developed a passion for ham radio and then hooked up with James Gang in 1968, bringing his hot-wired pick-up flair to the game. The Gang’s career coincides with the move from singles to album-orientated material; their place in the birth of the FM revolution shouldn’t be forgotten. But it’s as a solo artist that Walsh starts to take off. The Barnstorm album (1972) is a thrilling affair. Walsh aside he’d enlisted Joe Vitale and Kenny Passarelli and they became the first outfit to record at James William Guercio’s Caribou Ranch in Colorado. Despite the sturm und drang at their disposal the trio opted for a more folksy acoustic approach, albeit layering their sound with a barrage of ARP Odyssey effects (Who man Pete Townshend had shown the instrument to Walsh after using it to grand effect on Who’s Next) as well as fuzz boxes and Leslie 122 cabinets which lend a spaced depth to string instruments. ‘Mother Says’ and ‘Here We Go’ are stuffed full of that invention while the stately rocker ‘Turn to Stone’ (Joe later revisits this on his So What disc) perked ears in smarter critical circles. Lovely items like ‘Birdcall Morning’ and ‘Comin’ Down’ also repay close investigation. Small wonder that Barnstorm was bestowed with 5* reviews, it’s audacity compared to that of Steve Miller Band. Walsh’s relationship with producer Szymczyk now bears lush fruit on The Smoker You Drink, The Player You Get (1973), the release that leapt out of British import racks and became one of the hippest albums of the decade, not just because the cover features a British Sopwith Camel. That good Colorado air did the trick again and ‘Rocky Mountain Way’ (mind blowing in Quadraphonic!) provided the pathway to stardom. Combining a broad palette of musical sounds from blues to Afro-Caribbean, and hard rock to the lightest folk we keep this on heavy rotation. The hit single aside there were many other reasons why this soared into the Top 10. The radio hits ‘Meadows’ and ‘Dreams’ and Joe Vitale's ‘Days Gone By’ are favourites too. 1974’s So What includes a slicker and far more considered version of ‘Turn to Stone’ and a brace of songs forged from personal family tragedy – ‘Song for Emma’ and ‘Help Me Through the Night’ – with cameo vocal assists via Eagles Don Henley, Randy Meisner and Glenn Grey. The solos are classic rock class – good as it gets – and the singing is warm and deeply felt. Check the rustically Anglophile ‘County Fair’ and the opener ‘Welcome to the Club’ to see and hear how Walsh is now become one of the LA jet set but retains his sense of humour. The live You Can’t Argue with a Sick Mind (1976) has been labelled the all-time greatest Joe Walsh concert souvenir and actually it is! Recorded as he was in line to replace Bernie Leadon in the Eagles – a hush hush moment – Walsh is out on the town with Henley, Spirit man Jay Ferguson, Traffic’s Dave Mason and funk bass ace Willie Weeks backing him up. This slipped through the net at the time but it sounds great now. So does 2012’s come back king affair Analog Man. Produced with Jeff Lynne of Move/ELO fame, this is an adventurous and thoroughly modern disc, certainly no dinosaur throwback. The return of an idiosyncratic talent was heralded in right thinking circles and the tracks within indicate why. ‘Lucky That Way’ – a real slice of atavism – the title track and the confessional ‘One Day at a Time’ and ‘But I Try’ operate like a life support system and chapters of raw yet intimate rock star autobiography. Knowing accomplices include Ringo Starr (Joe’s been a regular in his All-Starr outings), David Crosby and Graham Nash and it’s great to hear Barnstorm mates Vitale and Passarelli reunited for ‘Band Played On’. 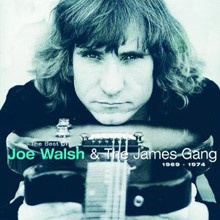 Wrapping things up nicely is the Best of Joe Walsh and The James Gang 1969-1974, which is eighteen tracks and none of ‘em whack. Joe and the Gang at their very best this is one of our most played compilations of the season. But seriously folks, as Joe’s been known to say, do fill yer boots. Joe Walsh’s music is the gift that doesn’t just keep on giving, it arrives in a chauffeur driven car with roses and champagne. We’re not sure about smoker and drinker but player he most certainly is. Joe Walsh, we salute you, sir. Barnstorm is the first album by Joe Walsh following his departure from the James Gang, released in October 1972 (see 1972 in music). The core band on this album – Walsh, bassist Kenny Passarelli and drummer/multi-instrumentalist Joe Vitale – was also named Barnstorm. It was the first album to be recorded at Caribou Ranch in Colorado. 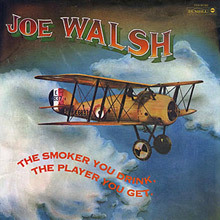 The Smoker You Drink, the Player You Get is the second studio album by Joe Walsh, released in 1973. It proved to be his commercial breakthrough, largely on the strength of the Top 40 hit single, "Rocky Mountain Way", which helped propel the album into the Top 10. On this album, Walsh shares the vocals and songwriting with the other three members of Barnstorm, drummer/multi-instrumentalist Joe Vitale, bassist Kenny Passarelli, and the new member, keyboardist Rocke Grace. As a result, a variety of styles are explored on this album. There are elements of blues, jazz, folk, pop, and even Caribbean music. 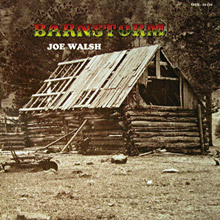 After the success of this album, Barnstorm disbanded, and Walsh continued making albums as a solo artist. 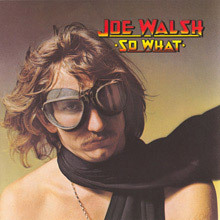 So What is the third album by Joe Walsh, released in 1974 (see 1974 in music). It contains hard rock such as "Welcome To The Club" and a remake of the Barnstorm track, "Turn To Stone". It also contains more introspective material such as "Help Me Through The Night" and "Song For Emma", a tribute to Walsh's daughter who had been killed in a car accident the previous year. On a few tracks, Don Henley, Glenn Frey, and Randy Meisner of the Eagles contributed background vocals. Over a year and a half later, Walsh would be drafted into the Eagles to replace Bernie Leadon. So What was originally released by ABC Records in 1974 and re-issued by MCA Records in 1979. 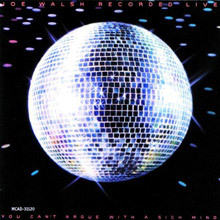 You Can't Argue with a Sick Mind (subtitled Recorded Live) is a live album by Joe Walsh, released in 1976. Recorded live just before Joe joined up with Eagles, who also play on "Help Me Through the Night". This was Walsh's last album release on ABC Records. It was re-issued by MCA Records in 1979. 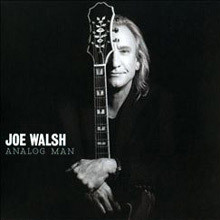 Best Of compilation covering Joe Walsh's solo career as well as his albums recorded with Barnstorm & The Last Gang.